If we encountered alien life, how would you react? 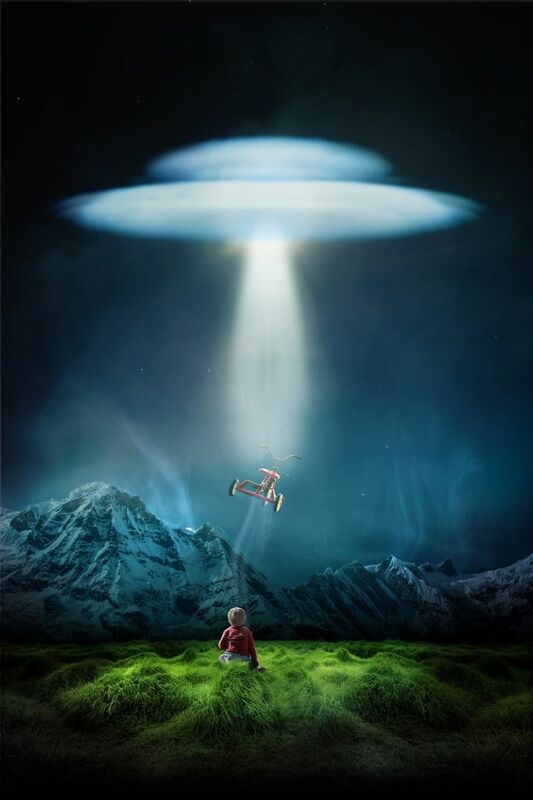 If mankind were contacted by an alien race, how would the world react? How would people change? In his novel, Contact , the late, great astronomer Carl Sagan explores this fascinating question. I recently had the pleasure of reading Contact, and one of the aspects I most admired about it was Dr. Sagan’s humble suggestion that communication with an alien race would compel mankind to reassess its internal conflicts and prejudices. “By now, the news of the Message from Vega had reached every nook and cranny of the planet Earth. […] Amidst the sectarian commentary, there was also—all over the world, it was now apparent—a sense of wonder, even of awe. Something transforming, something almost miraculous was happening. The air was full of possibility, a sense of a new beginning. There were still political conflicts, some of them—like the continuing South African crisis—serious. But there was also a notable decline in many quarters of the world of jingoist rhetoric and puerile self-congratulatory nationalism. There was a sense of the human species, billions of tiny beings spread over the world, collectively presented with an unprecedented opportunity, or even a grave common danger. To many, it seemed absurd for the contending nation states to continue their deadly quarrels when faced with a nonhuman civilization of vastly greater capabilities. Sagan speculates that an extraterrestrial message would have the effect of revealing to mankind the folly of its divisions against itself. He seems to suggest that our national boundaries, in the face of a situation affecting the entirety of our small, blue world, would appear as little more than arbitrary lines drawn in the sand, reducing our obstinate and ego-driven political conflicts to little more than unreasonable disputes among siblings, and ushering in a newfound spirit of cooperation and peacemaking. A beautiful proposition, to be sure. The subtextual message to be drawn from this is that we would be wise to reach these realizations on our own, and that sometime (probably in the not-too-distant future) we must. In the face of looming environmental crises and continuing war and conflict in 2013, Sagan’s message remains supremely poignant. Understanding our inherent unity and shared destiny as natives of Earth should not require an event of galactic magnitude. In the coming decades, it will be our responsibility to find in our hearts a Sagan-esque cosmic perspective, if we are to band together and confront the sizable challenges facing our planet. One is reminded here of what has been called “the overview effect,” which refers to the profound shift in perspective that is said to be experienced when one views the Earth from space. There is a wonderful documentary, just under 20 minutes long, that shares the life-changing stories of astronauts who have seen the Earth from the outside: watch it here if you’re interested. Sagan was certainly someone who believed in the transformative power of viewing the Earth from a different vantage point. 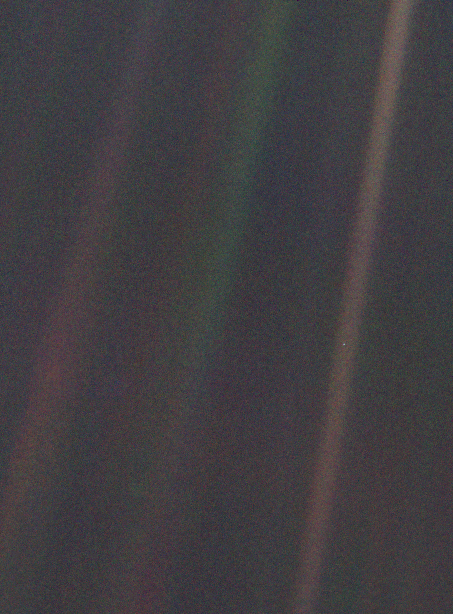 One of his most famous quotes was made in reference to the image below, dubbed the “Pale Blue Dot” image, which is also the title of Sagan’s book that discusses the image . “Look again at that dot. That’s here. That’s home. That’s us. On it everyone you love, everyone you know, everyone you ever heard of, every human being who ever was, lived out their lives. The aggregate of our joy and suffering, thousands of confident religions, ideologies, and economic doctrines, every hunter and forager, every hero and coward, every creator and destroyer of civilization, every king and peasant, every young couple in love, every mother and father, hopeful child, inventor and explorer, every teacher of morals, every corrupt politician, every “superstar,” every “supreme leader,” every saint and sinner in the history of our species lived there—on a mote of dust suspended in a sunbeam. The Earth is a very small stage in a vast cosmic arena. Think of the endless cruelties visited by the inhabitants of one corner of this pixel on the scarcely distinguishable inhabitants of some other corner—how frequent their misunderstandings, how eager they are to kill one another, how fervent their hatreds. Think of the rivers of blood spilled by all those generals and emperors so that, in glory and triumph, they could become the momentary masters of a fraction of a dot. Our posturings, our imagined self-importance, the delusion that we have some privileged position in the Universe, are challenged by this point of pale light. Our planet is a lonely speck in the great enveloping cosmic dark. In our obscurity, in all this vastness, there is no hint that help will come from elsewhere to save us from ourselves. The Earth is the only world known so far to harbor life. There is nowhere else, at least in the near future, to which our species could migrate. Visit, yes. Settle, not yet. Like it or not, for the moment the Earth is where we make our stand. 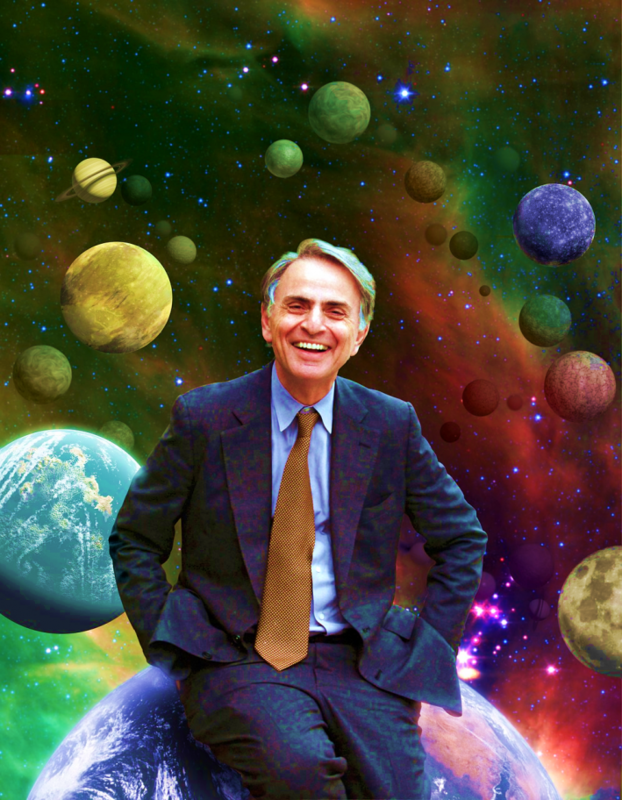 Carl Sagan’s life was dedicated to the advancement and betterment of our species. Though he is perhaps thought of first as one who spent his life gazing outward, his writings reveal a strong commitment to humanitarian concerns. 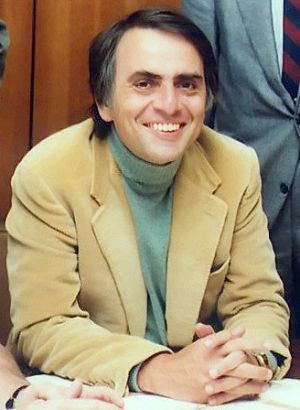 Sagan in 1980. Image via Wikimedia Commons. This begins with each of us. When we practice kindness, acceptance, and non-aggression in our daily lives, we do the work of slowly creating that of which so many have dreamt: a loving and non-violent world.His advice to us, like that of so many great teachers and leaders of history, is simple and unmistakable. From beyond the grave, he urges us to band together, to see through our artificial and constructed differences, to embrace one another as members of a single global community. He suggests in utter seriousness that the future of our planet and species depend on this transformation of heart and mind. Sagan left the world a wonderful legacy, and we should honor him by striving to become what he envisioned: compassionate, peaceful, and unified.